Is Gold – Or Fiat Currency – In a Bubble? It is easy to argue that gold is in a bubble. Gold prices would need to surpass USD 1,455/oz to be considered extreme in real terms and hit USD 2,000/oz to represent a bubble. Louise Yamada, the eminent technical analyst who for many years worked at the various firms that have coalesced into Citigroup and now presides over LY Advisors, last week remarked in a client note that gold—based on its current trajectory—most likely wouldn’t represent a true bubble unless and until it gets to $5,200 an ounce (from its $1,317.80 December-contract close on Friday) within a couple of years. Adjusted for inflation, the price of gold today is 41.5% below the January 1980 peak of more than $2,000 per ounce (in 2010 dollars). “If you take a look at previous cycles, super cycles, we’re far from it,” he said. “If gold were to go to 1980 prices like most commodities have gone to, gold would be over $2 300/oz,” Holmes commented. WJB Capital Group’s John Roque pointed out in May that the current gold bubble is still much smaller than the bubble in the 1970s when priced against the S&P. Brett Arends, a columnist for The Wall Street Journal and MarketWatch, estimated that “individuals bought $5.4 billion worth of gold, and sold about $2.7 billion, (so) their total net investment comes to $2.7 billion” in 2010, through early summer.Arends contrasted that with the $155 billion they shoveled into bond funds through July. That may be the real bubble. Before we assume the gold bubble has hit its peak, let’s see how it compares with the last two bubbles—the tech mania of the 1990s and the housing bubble that peaked in 2005-06.The chart is below, and it’s both an eye-opener and a spine-tingler. It compares the rise in gold today with the rise of the Nasdaq in the 1990s and the Dow Jones index of home-building stocks in the 10 years leading up to 2005-06. They look uncannily similar to me. So far gold has followed the same path as the previous two bubbles. And if it continues along the same trajectory—a big if—gold today is only where the Nasdaq was in 1998 and housing in 2003. In other words, just before those markets went into orbit. [JP Morgan’s] Michael Cembalest indicat[es] that ownership of gold in dilutable terms (aka dollars), as a portion of global financial assets has declined from 17% in 1982 to just 4% in 2009. And even though the price of gold has double in the time period, as has the amount of investible gold, the massive expansion in all other dollar-denominated assets has drowned out the true worth of gold. Were gold to have kept a constant proportion-to-financial asset ratio over the years, the price of gold would have to be well over $5,000/ounce. (Durden points out that when derivatives are factored in, the percentages are even more dramatic). Debt is in a mega trend. Eventually, the magnitude of the situation and its repercussions will become more obvious. That’s also why the U.S. dollar will continue to fall because more spending and money creation makes the dollar worth less, and gold will keep rising because it is real money. This is one main reason why they’re in mega trends too. We clearly believe that gold and silver are far from being in a bubble…. The value of the whole monetary system is under question and until this very issue is resolved, gold and silver will prevail. You probably think gold is in a bubble. After all, it hit new highs in dollars, pounds and euros this week – and has pretty much quintupled since its lows of 2001. 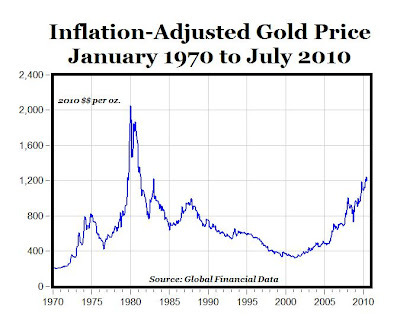 But look at the actual price of gold and it is hard to see real evidence of a bubble. Gold may have hit new highs in nominal terms, but it hasn’t come close to hitting its old highs in real terms. Adjust the 1980 high of $850 for US inflation and you get a price of around $2,400 – a level only the most bullish are predicting even now. Then look to the last few years. The bears would have you believe that the gold price has somehow gone “parabolic”. But, in fact, the price in US dollars has only risen around 25% in the last two years. Given all the unfunded liabilities and the money printing in the world and the size of the financial assets in the world, I don’t think we are in a bubble. This currency bubble is the largest bubble of all time in history. It is the mother of all bubbles. If you don’t have gold…..you are going to be scre*ed. Calls of a gold bubble are shallow moronic pontifications, since the sanctioned asset bubble is the mammoth US Treasury variety. It is the last bubble before systemic failure. . . . The Gold bull will continue as long as the cost of money is negative. Investors flee the conventional paper vehicles like stocks, bonds, and housing since the system is failing and paper money in which values are denominated is fast becoming meaningless. In September, even Alan Greenspan was singing from the same hymn sheet, saying that “fiat money has no place to go but gold. Gold is not in a bubble, silver is not in a bubble, precious metals are in general terms not in a bubble. If there is a bubble, it’s in Triple A-rated Treasury papers, whether from Germany or United States. Precious metals are in demand for very simple reasons: We have an inflexible supply due to a lack of exploration and we have an increasing demand due to various factors. One factor is definitely the debasement of the U.S. dollar. The second aspect is that the global wealth is increasing quickly, in particular in the emerging-market countries. Five billion of the world population are having higher living standards and thus are consuming more precious metals. Thirdly, and that is very important: smart central banks start to accumulate gold rather than accumulate printed paper from the United States. According to Dictionary.com, the definition of a speculative bubble is “a temporary market condition created through excessive buying and an unfounded run up in prices occurs.” If there is one asset that commonly gets described as being in a bubble, its gold but let’s look at its move over the past 10 yrs in perspective compared to other “bubble’s.” Gold at $1400 is up 450% from the Aug ’99 low. From 1982 to 2000, the NASDAQ rose 3000% and the DJIA rose 1400%. From 1978 to 1989, the Nikkei rose 700%. From July ’98 to the high in July ’08, crude oil rose 1245%. From its low in Nov ’01, copper has risen 605%. I’m not calling a bubble in Apple but its up by 4850% since 2003 for the obvious reasons. Thus, just because an asset is higher and has done well for years doesn’t mean its a bubble, YET, and this gold rally which I’ve been bullish on for many years, still has room to run. Gold is not the inflation hedge most people think it is. Here is a data point that will give you some perspective. In 1869, gold traded at $162; in 1969, it traded at $35. How gold hedged inflation in any way over this period of a century is lost on me. It is a fact that stocks and real estate more closely tracked the rate of inflation. Price movements in gold resemble price movements in stocks. Intense bear markets are followed by spectacular bull markets, which culminate in a spike move fueled by human emotion. The same 100% moves in real estate that would signal a bubble of massive proportions are normal moves in gold. While the price movement of gold in absolute terms is important, the price movement of gold expressed in relation to time is even more important. A 100% rise in 5 years means nothing, although a 100% move in 2 months means everything. Everyone invested in gold should be more focused on time. Each asset class moves to its own rhythm. 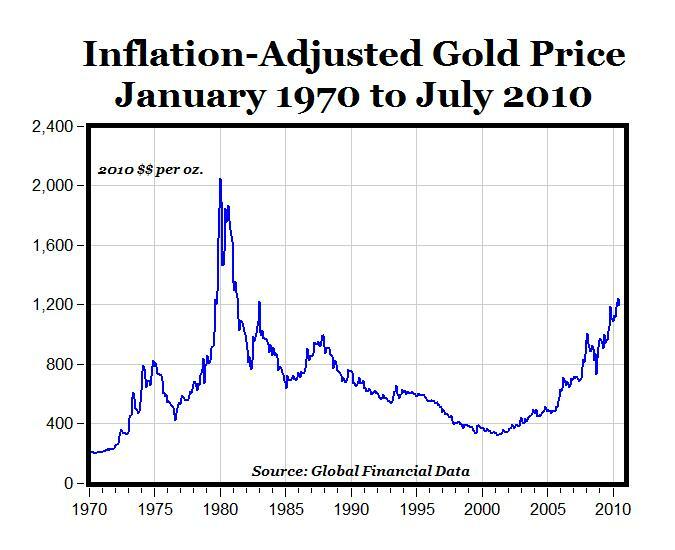 To say that gold is a bubble merely because it has risen 6x is just plain ignorant. Gold has always shown that it is an asset that lies dormant for decades, only to experience the biggest moves in the shortest amount of time. There is no reason for me to believe that “this time is different.” Gold has yet to do anything but trend upwards in a classic bull market formation. If and when the trajectory of the rise steepens, that will be the time to start thinking about getting out. For extensive background information regarding gold, see this. Note: I am not an investment adviser and this should not be taken as investment advice.